In this lab you will learn how to configure basic TCP/IP redistribution between three routing protocols, RIP, IGRP and OSPF. You should be familiar with configuring these routing protocols before you begin this lab. 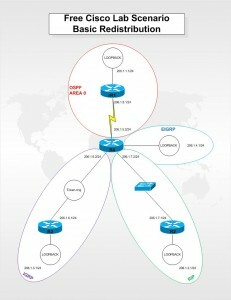 Configure the routers to match the diagram in the left margin labeled topology. Use the network address specified on the diagram. Never use static routing at any time to complete this lab. Keep diagrams of your network including all network addresses and the routing domains for each routing protocol? 1. Assign IP address to each interface listed on the topology map. Use only the interfaces shown on the map. Ensure connectivity between adjacent routers with pings. 2. Configure each router to begin exchanging routing information for each of the connected networks, via the correct routing protocol. 3. Configure redistribution between the three different routing protocols so that all networks show up in all the routers routing tables. Do no use the redistribute static command. Ensure connectivity by pinging every interface from every router. 4. Ensure that your routing tables are stable and routes are not changing. This is a pretty basic lab without any weird twists or places to trip up, but here are few things that might cause you some problems if you are pretty new to this. 1. Normally a router’s serial sync port is connected to a DSU/CSU that provides the clock signal to tell the port what speed to run at. When using a cross over serial cable, as we do on the rack you must set to clock rate on the port that has the DCE end of the cable. All cross over cables in this rack have the DCE end connected to router R1 or the Terminal Server (TERM_SRV). 2. Don’t forget to set the Token Ring, ring speed before trying to bring the interface up. Cisco router token ring ports can run at 4Mbps or 16Mbps. You must set the ring speed before issuing a “no shutdown” command. 4. Several routing protocols require you set default information for the redistribution of routing information. For instance, how does the router know what IGRP metric to place on a RIP learned route? They use totally different metrics. Generally it is always a good idea to set a default metric on any routing protocol that has redistribution enabled, although you can see from the solution that is not always necessary. Just checking on the comments from other people reading your post. I am actually impressed how these people found your post. There are not many web sites with data like this man! Bookmarked!